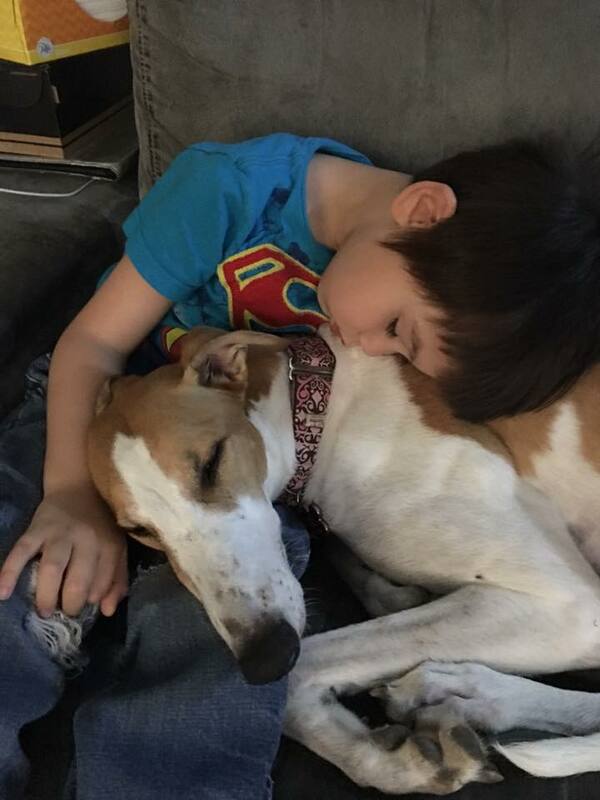 If you've investigated Greyhound adoption or if you've been around Greyhound adoption for a while, you know that many adoption programs have decided that kids and Greyhounds do not mix. Many Greyhound adoption programs have made the decision not to place their dogs in homes with children under the age of 5. Much like the "we won't place Greyhounds without fences" policy, it has always been our feeling that no rule solidly describes a family dynamic. Some homes can handle toddlers and dogs and some can't. Some families can manage leash walking their dog at 3am in 6 inches of snow and some can't. Not placing a dog with kids or without a fence is certainly the easy thing to do. The harder thing to do is to educate that family with every tool in our toolbox about how to best manage the situation and then, stick by them no matter what happens; until it either works out or it doesn't. Most times, our education is a key factor in the success of the placement and sometimes...it's just our ability to have faith in humanity. Greyhounds ARE pack animals. They were born with their litter, they were raised with their litter, they were trained with their litter and then they were sent to the track with their litter and 40+ more new pack members. They are being trained as competitive athletes so, why would anyone be surprised when their new pet Greyhound is also a competitive family member? They want to come in the door first, they want to eat first, they want to beat you to your next destination in the house, they want to compete. Even the racing failures often have this drive to be first. As their new pack, your family now becomes the competition and as their new pet owner, it is your job to help them understand that competition is no longer necessary and to help transition them into a relaxed retirement. With competition in mind, the easiest pack members to beat are the kids. Greyhounds aren't stupid. The kids move fast, they talk loud, they are easy to push out of the way and they drop food on the floor. This is clearly the competitor to beat! Heck, they are pretty big pushovers too so, if the Greyhound gives a little lip curl or even a soft growl, they are certain to get their way. If the kids are the target competition and running fast isn't the game, what does the Greyhound have to gain from them? In their minds...power. Position in their new pack. What's the most powerful position in the house? THE FURNITURE!!! Where does the king sit? On his throne? Where do toddlers sit? Oh-so-often, it's on the floor. By letting your competitive race dog on the furniture while your toddler is on the floor, you have just given your new family member permission to move on up the pack ladder. By letting your competitive race dog lay in your bed while your young child is relegated to its crib or toddler bed, you are telling the dog who is most important. Think about it. They aren't stupid...they are competitors; boundary pushers; teenagers if you will. MoKan Greyhound Adoption stands by our less easy decision to place Greyhounds in all types of qualified homes and we continue to support our adoptive homes toward success. Every single time that we get that call from an adopter that says "my Greyhound is growling (and/or snapping) at my child what do I do" our first question is ALWAYS the same. Why is the dog on the furniture? You don't have to tell us, we didn't have to see it on Facebook, we just know it's the question to ask. We warned you in the home visit that it would happen and now it has. We told you in the home visit to be 100% certain that you know who your dog is before you allow it on furniture (our recommendation is always 6 months or more) and you decided that your judgment was better than our years of experience. Teaching the dog to get on the furniture after you've had it for 6 months or longer is much easier than helping it understand that it can no longer be on the furniture because now it's snapping at the other pack members. We talk about dominance most of all with our families who have children under the age of 13. Not because Greyhounds (or any dog really) can't try to exert dominance over adults too but, because if the situation should escalate to a dog bite, the child is more likely to suffer more damage than an adult. Your competitive athlete should NEVER be allowed to be the boss of the household and, with some smart family ground rules, with thoughtful and realistic consideration for who your Greyhound is as a personality and with patience and guidance, proper pack order is very easy to achieve and maintain.